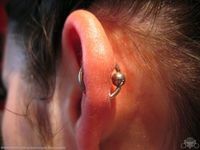 Similar to an industrial piercing, an orbital piercing is two piercings connected by a single ring. Usually the piercings are done using two separate pieces of jewelry for healing -- swelling can make a single ring complicate the healing process. Once healed, a single captive bead ring, circular barbell or D-ring can be used. This page was last modified on 5 May 2006, at 13:40. This page has been accessed 96,516 times.